Capcom saw huge success in 1989 with Final Fight in the arcades, which is arguably most responsible for maintaining the scrolling “beat-em-up” genre’s relevance post Double Dragon. Their 1990 home port, exclusive to the SNES for reasons unclear, fell short of expectations. This gave Sega an opportunity which they gratefully took. Streets of Rage was released in 1991, and is rather obviously a response to Final Fight. Now I don’t have enough information to say that it’s an intentional rip-off – perhaps after Capcom denied Sega a port – but it is pretty clear that the two teams were at least working off the same outline. Both games have you moving through levels with nearly identical themes – progressing from slums, to industrial areas, to a one-screen construction elevator, to the opulent penthouse of the big bad. Both games feature a white-shirted, blue-jeaned protagonist whose intimidating martial arts yells sound an awful lot like a goose. 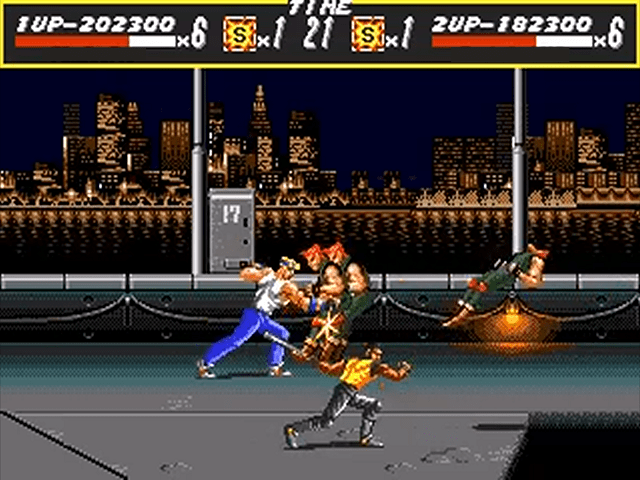 Both games have you bopping through a gang consisting of fat sumo guys, towering Andre the Giant style wrestlers, generic thugs, and female punks. It could all be a coincidence, but I really doubt it. The game’s seven levels have you cleaning up the streets as one of three ex-cop fighters with varying attributes. Each character’s strength is balanced with reduced effectiveness elsewhere, like Blaze’s fast foot speed at the cost of attack power. While the characters share the same attacks, each executes it a little differently for a little further variation, like a jump kick with a greater reach, or different strikes in their standard combos. Characters also enjoy some unconventional moves, like a cartwheel over an enemy (ending in a pile driver) to get out of being surrounded, or a backfist strike by smashing B+C. The A button calls up a police cruiser to launch some screen-clearing ordinance, and this super attack is best saved for bosses. Overall, average stuff, and here’s where I might get controversial. 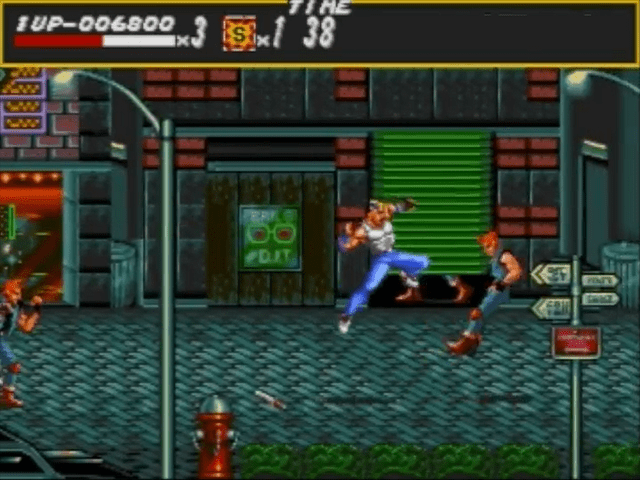 Streets of Rage alone has almost nothing going for it. It’s an excellent alternative to Final Fight, but if Final Fight had been released for the Genesis, this first effort would likely have been forgotten. It’s not until later games that the series really starts to establish itself, and this first attempted seems rushed to fill a brawling void on Sega’s console. Co-op gameplay is the game’s definite strength. For one, it’s stiff. Part of this is in the animations – there are relatively few frames spread around. There are enemies that throw punches where only their arm is animated, or women who transition instantly between a fighting and “defeated” state on the ground. 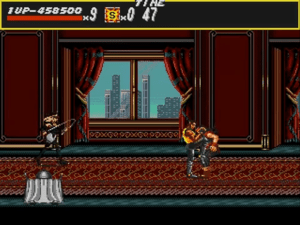 Enemies have no “character” animation as in Final Fight; which was also economical in its frames, but added things like foes shaking their heads as they get back up, or ducking and weaving as they wait to attack. When Haggar digs his fist into a Final Fight goon’s stomach, brother, you feel it. No such extras in Streets. 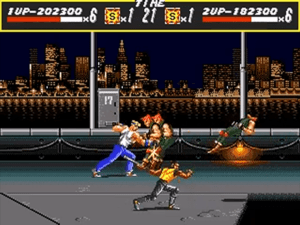 Final Fight also had different “introductions” for some enemies – you’d come across thugs leaning against a wall or playing dice before they sprung up to attack. Streets simply has enemies moving in from either side of the screen. You could chalk this up to comparing an arcade game to a console cartridge release, but all of the above was maintained in Final Fight’s SNES port. It’s extra presentation fluff that does matter, that Streets simply didn’t include. Your character’s attacks and movement also feel stiff, but after playing Final Fight and Streets back to back, movement speed is actually about the same. Characters walk slowly and attack slowly in both, but the difference is Streets’ view. The virtual camera is pulled back considerably, using smaller sprites and a much wider view. This both limits the details on individual characters and makes movement feel more sluggish, because now there’s more ground to cover. AI is mostly standard. The basic thugs do a good job of staying back and then rushing in to strike. Timing is critical when fighting them. If you miss your punch as they approach, you’ll almost always get caught in some kind of short combo you can’t break out of. Meanwhile, bosses are pretty easy to exploit by approaching them diagonally, and the giant wrestlers comically keep charging forward to eat a well-placed jump kick. If you keep your awareness and timing sharp, it’s not too hard to avoid damage. Streets also lets you keep picked up weapons for the entire level, as long as you don’t get hit. Streets excels in its backgrounds. A muted color palette gives a gritty feel, while effects like neon or a beach rainstorm add a little life to the levels. The bridge level with distant city lights reflecting across some “rippling” water is a nice effect, as is the moody harbor passing by on the boat level. You can even see night transition to dawn through the windows across the final level, giving a nice sense of drawing this hectic night (and your quest) to a close. Music is also pretty excellent all around, with great use of the Genesis’ bass thumps and techno instrumentation. I especially love the sustain at the end of level point tally riff – classic Genesis effects. That ending also deserves special praise. The final boss will give you a choice to join him. It’s an actual choice with a Yes/No prompt. Saying “Yes” is a terrible idea in single player, as it will simply force you to repeat some levels. But in two player, you’ll fight each other if you pick different answers. All the co-op up to this point gets thrown out, and the victor fights the boss alone. If they should win, the ending screen changes to show them seated on the boss’ throne, now controlling the gang. It’s a great idea that really adds something extra to a 2-player game. I imagine many a player glanced over at their partner, looking for smirking signs of an impending betrayal. That’s the first Streets of Rage. It’s pretty enough and responsive enough, but kind of forgettable. As with most games like this, 2-player co-op is where the game really shines, and the extra little twist at the end is brilliant fun. 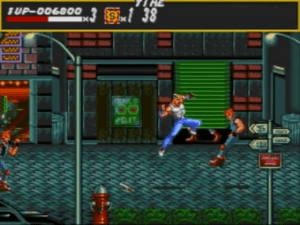 Otherwise, fans of the genre will enjoy another fairly standard entry, but it’s not until Streets of Rage 2 that the game starts to stand on its own. Nice graphics for an early Genesis game, with some better than average effects. Thumping soundtrack fits perfectly. Fighting is competent and easy to control. Two player, as always, is the most fun. The first game is an awful, awful lot like a poor-man’s Final Fight. Movement is rather slow and stiff, enemies are rather lifeless. Doesn’t establish itself as anything other than average until the sequel, and especially the third game. That’s wrong. Why should a company refuse to produce a game for a gaming systems that sold tons of units (anywhere outside of Japan)? Capcom simply wasn’t allowed to release games on Sega Systems (just like Konami, Tecmo and basically 90% of all developers at the time) because Nintendo had them all exclusively contracted since the NES days (It was a “Either you release your games exclusive for us or you don’t release games for Nintendo systems at all”) and it wasn’t until around 1992 when those companies broke free from Nintendo and were able to support other systems. All those Capcom (or whatever company) games that were released on the Master System or Mega Drive before 1992 were actually done by Sega (It always states in the title screen “Reprogrammed by Sega”), they just licensed the rights, the original companies were never involved. So if anything, Sega could’ve licensed Final Fight, make their own game and release it. But i guess they thought it makes more sense to just start their own franchise.